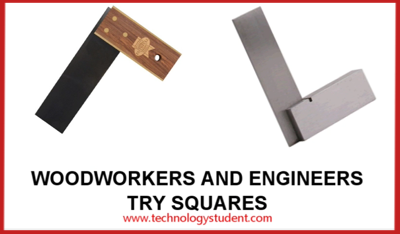 The engineers try-square is composed of two parts, the stock and the blade. They are usually made from bright mild steel with the blade being hardened and tempered so that it resists damage. A typical use of an engineers try-square is to mark out material for cutting/shaping. The try square is pushed against a straight side of the material (eg. steel). An engineers scriber is then used to scratch a line onto the surface of the metal. Sometimes engineers blue (a dye/ink) is wiped onto the surface first so that the scratched line can be seen easily. The material is then cut down to this straight line. Look closely at an engineers try-square, you should see an interesting feature. There should be a small slot that has been cut into the stock. This prevents small burrs caused by filing from altering the try-squares accuracy. Dirt can also collect on metal surfaces, again the slot helps prevent measuring angles inaccurately. In the example seen opposite, the try-square is used to test that a 90 degree angle exists across the edge of the steel. Although a burr exists on the edge of the steel it fits into the slot and does not affect the way the try-square is used. Draw an engineers try-square and label each part. Sketch one typical use of an engineers try-square.